Forget funny. Social media users want money. NEW YORK: The brand that garnered the most attention on social media during Super Bowl 50 didn’t run an official ad during the game. Instead, Esurance got more than 2 million people to use its #esurancesweepstakes hashtag as a contest entry, enticing them with a cash giveaway of more than $1 million, according to San Francisco-based Heat, the agency responsible for providing social media support to Esurance. Esurance beat out #PepsiHalfTime, as well as Mountain Dew Kickstart’s #puppymonkeybaby, which received mixed reviews online. "Twitter is where we wanted to win," said Nick Reggars, director of content strategy at Heat. Reggars said Esurance was logging 9,000 tweets per minute at times. To do that, Esurance resorted to a strategy that’s worked well for the brand before: giving away money. Esurance awarded 16 first prizes of $50,000, four prizes during each quarter of the Super Bowl. All tweets containing the hashtag or retweets of Esurance posts made since last Thursday were eligible to win. The brand engaged with followers and posted Twitter videos of some contestants finding out they had won. 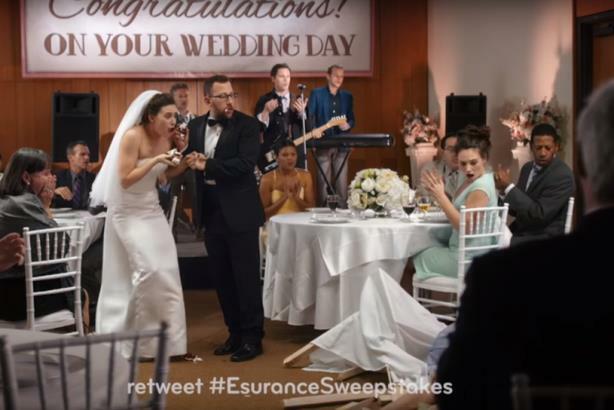 In 2014, Esurance used a similar tactic, running a single ad directly after the game ended that encouraged followers to tweet #EsuranceSave30 for a chance to win $1.5 million, a contest that resulted in 5.4 million uses of the hashtag. This year, a 30-second Super Bowl ad cost $5 million to air. Esurance ran two ads created by Leo Burnett Chicago, one before the kickoff and one after the game, when prices are much more reasonable. "We’re very happy with the deal we got on the two spots," said Dolleen Cross, senior manager of public relations at Esurance. The company also ran a paid promotion on Twitter. To capitalize on the expected popularity of the content, Esurance began it earlier, rather than during the game, drawing out the engagement far longer than the four-hour Super Bowl. While Cross wouldn't confirm how much the total package cost, it's a fair bet it was a lot less than the cost of a typical Super Bowl spot. Hopeful contestants weren’t the only ones who tried to engage with Esurance. McDonald’s and Pepsi both tweeted directly, as did the account for the upcoming Deadpool movie. The main character had a brief cameo in the second Esurance ad. Last year, Esurance ran an actual Super Bowl ad featuring Bryan Cranston as Walter White from Breaking Bad. A shift back to a predominantly social strategy could signal a change in direction for the company, which, after all, operates mainly online. "The thing about insurance is you’ve kind of got to be in the top three to be considered by a consumer," Reggars added, "so this for us is huge."